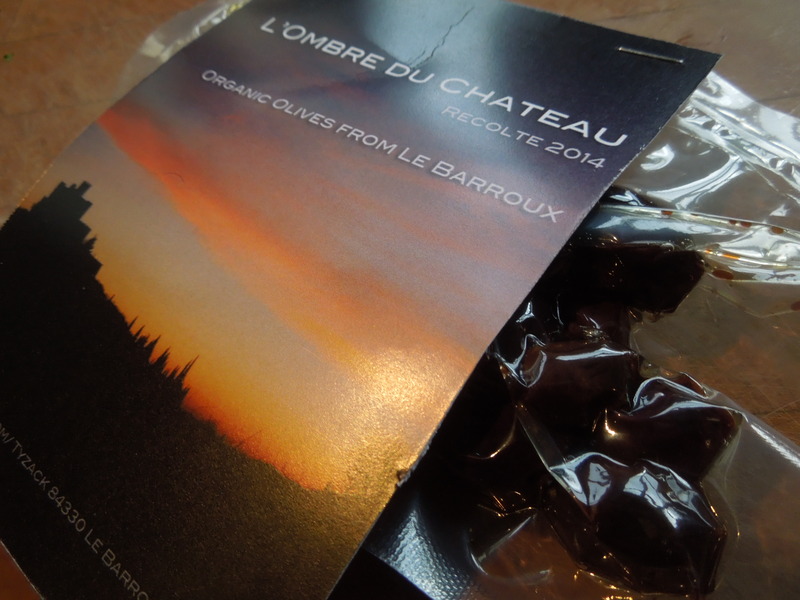 I have just had the loveliest present drop through the letterbox – a packet of home-preserved olives from our friends Katie and Ben. The olives come from their own trees in the Vaucluse in south-east France and they are delicious, fruity and salty and full of flavour. I think they are best enjoyed with a glass of wine – preferably watching the sun going down over the chateau near Katie and Ben’s house. A girl can dream. But as a trip to the south of France is sadly not an option and I’m sitting in a rain- and wind-swept house in Suffolk, this is the best alternative I could come up with. It’s a warming beef stew that will keep the British winter at bay, with sunny Mediterranean flavours to remind us that the cold and damp won’t last forever. 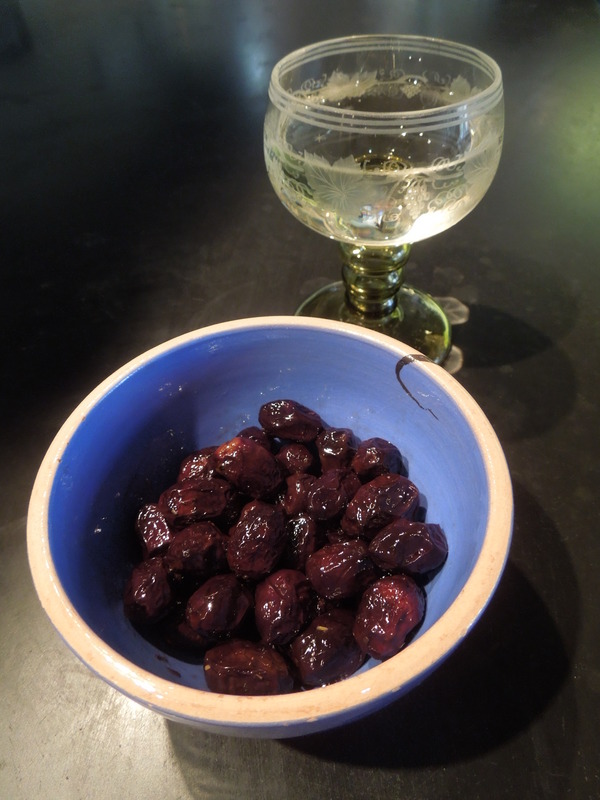 Katie’s olives proved to be the perfect cook’s treat as I chopped and sauteed my way round the kitchen. And as predicted they were a great accompaniment to a glass of chilled white wine. Preheat oven to 325F/160C/Gas Mark 3. 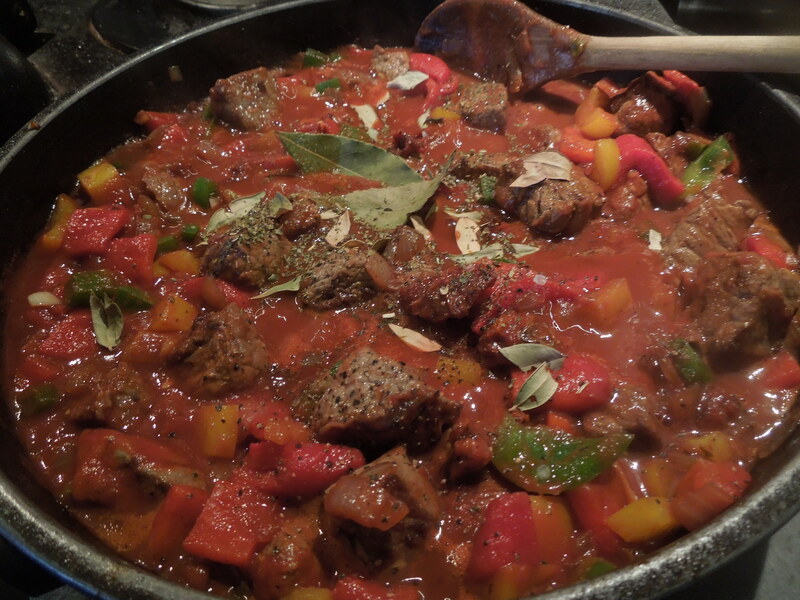 Heat a glug of oil in a deep frying pan or casserole with a lid and brown the beef in batches. Remove and set aside. In the same pan, fry the onions until soft and golden. Add the garlic and fry for a few minutes more. 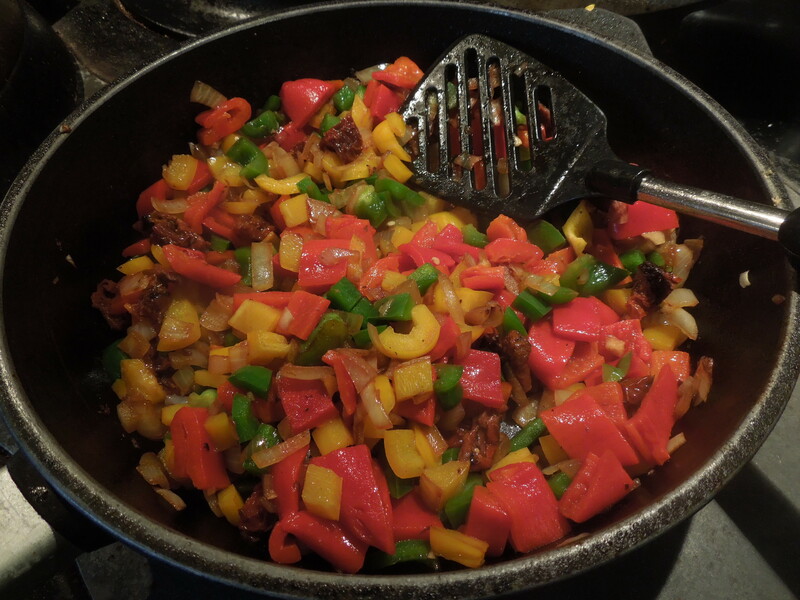 Add the yellow and green peppers and sautee briefly. Add the chopped red pepper and sundried tomatoes and stir through, then put the meat back into the pan. Pour in the red wine and let it bubble up briefly then add the tomato passata. Stir well, add the herbs and season to taste. Put the lid on, place in the oven and cook for about 2 hours or until the meat is tender. Add a little water if it looks as though it might dry out. 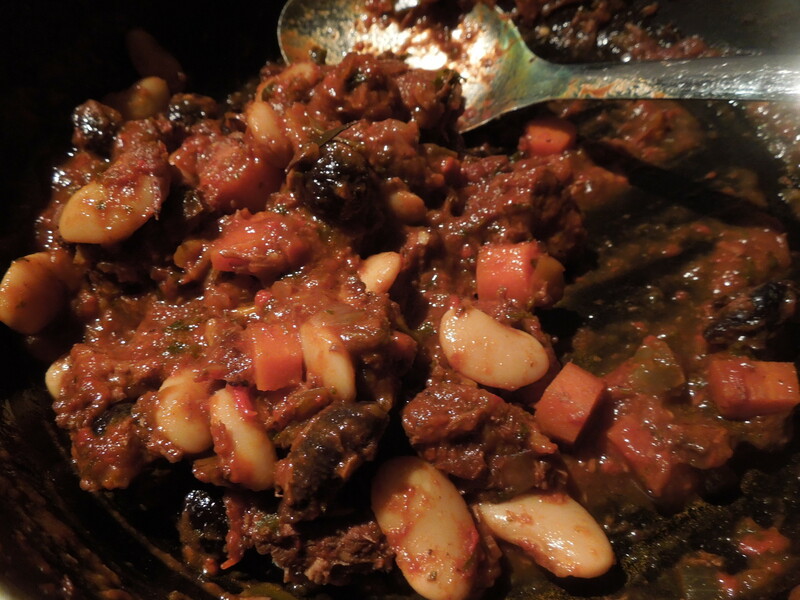 Towards the end of cooking, add the drained butter beans, if using. They help soak up the lovely, rich, tomatoey sauce and they bulk out the dish. The passata should produce a thick sauce but if necessary put the pan on the hob and reduce the stew until you get the consistency you want. Add the black olives and heat through. Garnish with a little chopped parsley and serve. You could try this with polenta, with potatoes mashed with a splash of extra-virgin olive oil, or simply stir in some extra drained tinned butter beans and heat through. This is even better reheated next day and freezes well. 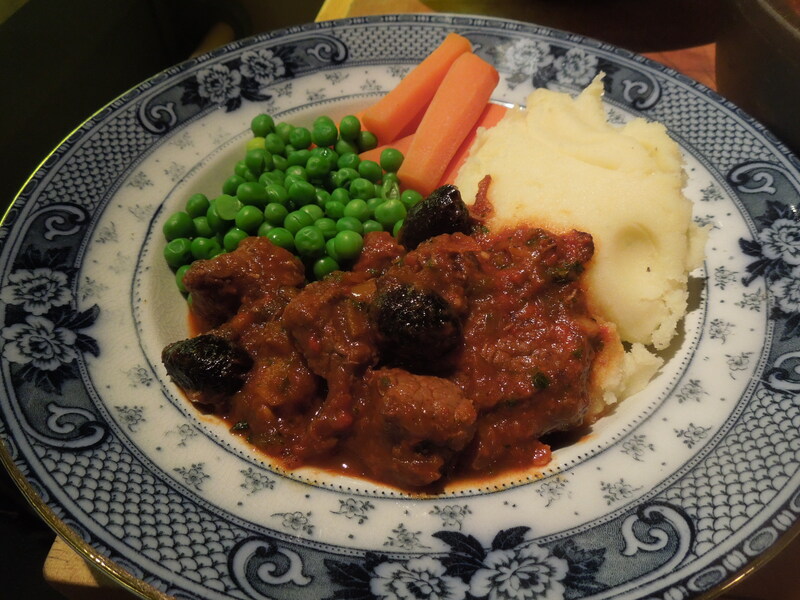 This entry was posted in Beef, Mains and tagged black olives, Mediterranean Food, peppers, Provencal beef stew, tomatoes by Linda Duffin. Bookmark the permalink. Gorgeous! Many thanks yet again. Thanks Penny, lovely to get positive feedback. Looks and sounds amazing and can imagine it will be even better the next day! My kind of food!! Thank you very much, Jacqui. It’s a very easy-going stew but packed full of flavour. Glad you like it! That looks nice and warming. And I do love a butterbean, had some in a sausage stew last night. I’ve never cooked with myrtle before – is it herby? Yes, usually small dried leaves – very aromatic and fragrant, hard to describe but has a whiff of allspice. You can sometimes find it on herb stalls at farmers’ markets. I love it. However, I try to avoid the vino while I am cooking. My resistance wanes and I always have to have another glass. The more I have the worse the cooking. Not a good idea for me. In spite of my frequent references to the cooking sherry, so do I, or the food suffers. I’d love to say that I can have one glass and stop, but mostly I’d be lying.